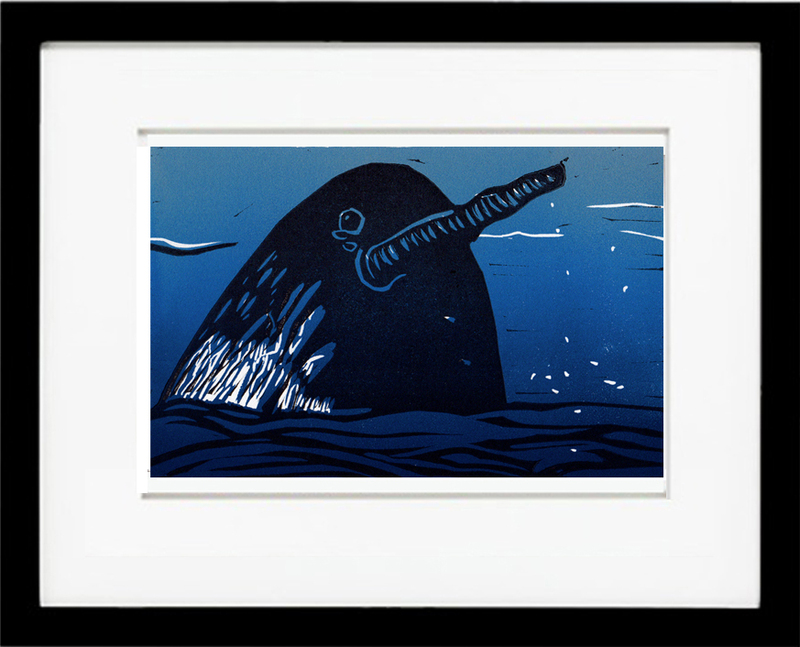 Narwhal, 10″ x 8″ linocut available on Stonetrigger Press Etsy $20. It is a whale? Is it a unicorn? Did a unicorn mate with a whale? It is a narwhal, over 80,000 of them live in arctic waters. The males boasts a long tusk, which is actually a tooth, they sometimes have two tusks. The tusks have over 10 million nerve cells and can be 10 feet long. These are clearly sensitive creatures! This is print number 40! It is hard to believe, 40 prints since January 1, and it is only February 17! This, is my favorite of all the prints. It is a reduction linocut. 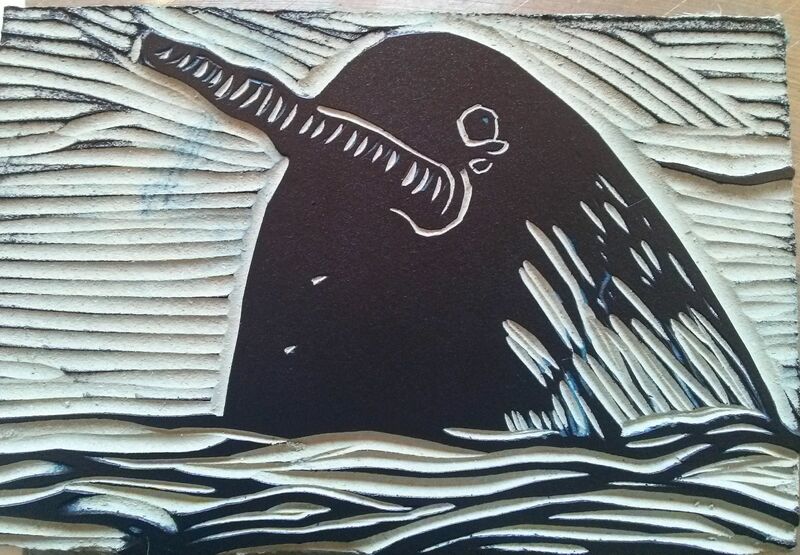 The first layer is printed with a rainbow roll of color, then part of the block get cut away and the narwhal appears. It is then printed a second time in the press, same sheet of paper. 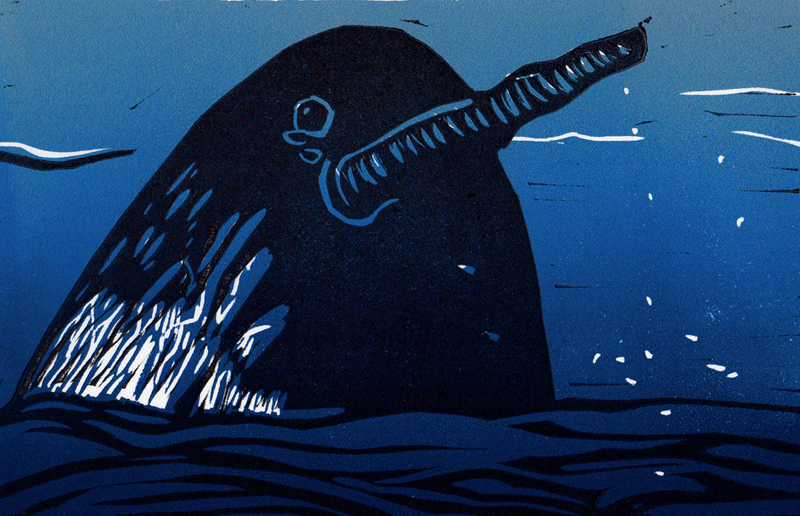 In fact I like this print so much, I am going to being a small artist book with a story about the narwhal. Are there any writers out there who may want to collaborate? Check out my Facebook page to see 9 steps of the printing process. It is pretty cool and a bit elaborate. Each print is hand printed by the artist, me, Hilary Lorenz in my studio, StoneTrigger Press in New Mexico. Every Monday through Friday I carve and print in an edition of 10 a new linocut and post it here for $20. It is my Print of the Day Project and available on Etsy.